As you may or may not know - I'm a Facebook Ads Junkie. This week I wanted to take some time to share with you a few types of ads that I've been running that have allowed me to skyrocket my profitability online. Each of these ads serves a different purpose, and all have been helping me generate income online. Below is a list of ads that I'm running or have run, and examples of some ads I've personally run. I've made the ad image clickable in case you wanna know where those ads lead. I recommend you take some time to read through these ads and see if any of them might work with your current business model. If they do - give them a shot, they've already helped me tremendously. Last week I developed a blog post that was designed to give tons of freakin' value, grow my list, and sell a low cost offer I've just started testing out. I ended up adding a decent number of my people to my list and actually making money from the post. The best part about this blog post and ad? Driving traffic to the post cost less than the revenue I generated. These types of ads create an avalanche of organic traffic when people like, share or comment on the post! Here's an example of the ad that I ran that generated some traffic, sales, and new leads for me! Tip: I also made sure to use a very Facebook friendly image so that it was very clear what they could expect when the clicked the ad! The Takeaway: Don't run random ads for traffic to your website - that's senseless. 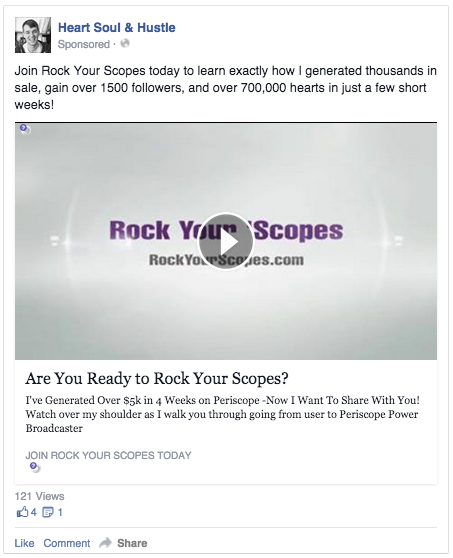 Instead create posts that are designed to generate income & leads, then drive traffic to those posts with Facebook Ads. They say it takes the average person to see something SEVEN times before they buy it. I'm not sure how true that is, but I do know that the more times you can get your offer in front of someone, the more likely they are to buy it. These ads are sorta like, "Hey, you know you wanna buy this, I saw you visit the page!" The ad I'm showing here cost me under $25 to run and generated five sales at $197 a piece. Meaning I generated over $900 in revenue from a $25 ad, not a bad deal right? Because you're targeting people that know about you, you don't need to spend a long time "developing" the perfect ad. Simple text and images convert here. The Takeaway: If you're selling or launching a product - consider running a re-targeting ad to those that haven't bought - it's an incredibly profitable plan! "Hey, haven't I met you before?" Everyone on your email list has come into contact with you - but they might not know you that well or haven't bought anything from you... yet. Tip: Combine this strategy with re-targeting to exclude people that have already bought a product from your list. 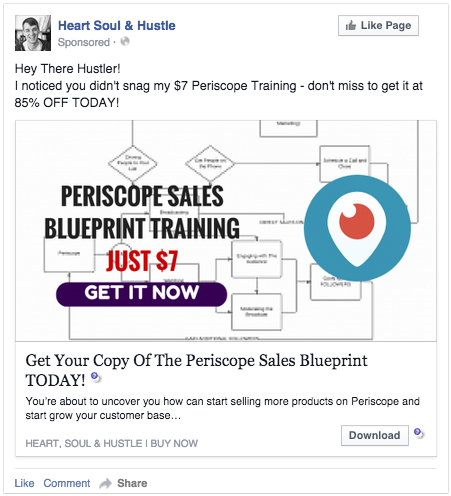 Below you can see an ad that I ran to people who were on my list but hadn't purchased a low cost Periscope training I offer. With this ad I can grow my "buyer's list" and since I make about $7 on each conversion I can do it for low or no cost. The Takeaway:Try running ads that target people already connected to you. Your "warm market" is much more likely to take action - and when it comes to Facebook ads, action is a GREAT thing! I've said it before, and so has every other big online business person, "The money is in your list!" You need to constantly be driving people to take action and join your list buy signing up for a "freebie" or lead magnet. In this case, I'm running an ad to my Periscope Workbook, and I was able to get people on my list with this ad between $1.25 - $1.98 which isn't a bad price for my industry. From there I was able to grow a list of emails - so when it was time to launch my program, I could literally make money from sending an email. It was a good week when that happened. The Takeaway: Always be growing your list! Running a Facebook Ad to do this allows you to grow your list automatically and results in larger sales numbers when you launch a product, program, or service! It's important to TEST Facebook Ads. This is literally my favorite part of Facebook Ads. I can't promise that these ads will convert for you, make you thousands, or change your business overnight. What I can tell you is that I'm pretty confident it will help and that running ads like this has changed my business. Creating Ads + Investing Money in Ads = More Sales, More Leads & More Business! So get out there and run some ads!